1. All provisions and references relating to the Committee were repealed because of an amendment to Article (8) as there was reference to the powers of the Committee under this article. 2. The law further specifically repealed Articles (27) on the constitution of the Committee and Article (28) on the jurisdiction of the Committee. Further amendments to the Law, which occurred by virtue of Law No 2 of 2010 restored the powers and jurisdiction of the Committee and added further significant and important provisions, which are discussed below. What are the significant amendments on the jurisdiction of the Committee? Article 27 of Law No 18 of 1981 provides directly for the constitution of the Committee, whereas under Law No 2 of 2010 it is prescribed that the Committee shall be formed by a decision from the Council of Ministers. This decision was issued on 10 April 2011 by H.H Mohammad Bin Rashid Al Maktoum, the Vice President of the UAE and Ruler of Dubai and in his capacity as Prime Minister issued the Council Of Ministers. The relevant decree is Decree No. 3 of 2011 for the Constitution of the Committee. The effect of Decree No. 3 of 2011 is that no court can entertain any dispute relating to commercial agencies during the period from February 2010 when the Law was amended and April 2011 when the Committee was established. In light of this it may be foreseen that disputes pending before the competent courts which are yet undecided may also be referred to the Committee due to the procedural and immediate nature of the amendment. Article 28 of Law No 18 of 1981 provides that the Committee shall be competent to look into any dispute that arises by reason of a commercial agency. Law No. 2 of 2010 imposes an additional qualification in that the dispute must relate to a registered commercial agency and not just a prima facie commercial agency arrangement. The significance of this is that the door to the Committee’s jurisdiction will remain firmly closed to all commercial agency disputes which are not regulated by a registered commercial agency. There is no room for interpretation in this regard.. Under Law No 2 of 2010 a new provision has been added to Article 28, the effect of which is that parties may not refer the dispute to courts before referring the same to the Committee. In essence, it introduces a tiered dispute resolution system. Such a system did not form part of the Law in its initial form. The significance of this amendment is discussed further below. In its initial form, the Law was absent a provision dealing with the timeframe within which parties could appeal or object to decision of the Committee. Law 2 of 2010 has amended Article 28 to include a provision parties may appeal decisions of the Committee to the competent Courts within 30 days from the date of notification of the Committee’s decision. Importantly, failure to appeal within 30 days will render the Committee’s quasi-judicial decision final. This implements an equitable process, and one which mirrors procedures adopted in Court. How to contest the Committee decisions? The Committee is required to issue its decision within 60 days of hearing the dispute. As stated above, the aggrieved party may contest such a decision before the competent court, by way of a traditional law suit. The Statement of Claim should include the particulars of the claim as required by the Civil Procedures Code. The parties shall be able to file all the documents and pleadings they wish, irrespective of those submitted at the Committee. These proceedings should be filed before the Federal Courts in Abu Dhabi as the Ministry should be joined as co-defendant to the proceedings. The Judgment of the Court of First Instance in this respect shall be subject to a right of appeal at the Court of Appeal and then subsequently at the Federal Supreme Court level. What is the Extent of Jurisdiction of the Committee? According to the clear wordings of Article 28 the disputes relating to registered commercial agencies have to be filed before the Committee first and may not be filed directly to the Court. Rather than being prohibitive, the regime is designed to foster early settlement of disputes before the parties incur unnecessary time and costs litigating in the Court. Although this provision was not included in the old provision of Article 28 of the Law, Federal Courts have historically refused to entertain disputes relating to commercial agencies. Such judgments were based on an understanding that Article 28 granted jurisdiction to the Committee. 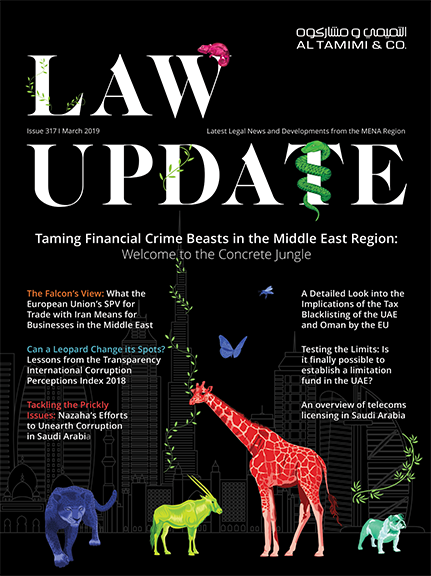 Even in the absence of the new provision formalizing this arrangement, it had already been the consistent approach of the UAE Federal Courts. Having said that, it is worth mentioning here that the Dubai Court of Cassation has adopted a different understanding and approach to this matter in the past. The Dubai Court of Cassation has issued several rulings confirming that it is not imperative to file the law suit to the Committee before the Court. In these cases the Dubai Court of Cassation held that complainant / plaintiff enjoyed the option of filing his complaint to the Court directly, without going through the Committee, or to file with the Committee first and thereafter with the court. In these rulings the Dubai Court of Cassation appears to have assumed that there is nothing in the commercial agencies law that prevents such a process. This is an important reasoning because the Court of Cassation has made it very clear that had there been any provision in the law that clearly outlined this process in that a claimant was obliged to first file the complaint with the Committee before filing with the Court, then this process should be followed. This could be understood from the judgments referred to even though they do not specifically hold so. Now, reading this in light of the amendment prescribed by Law No 2 of 2010 may give an indication as to the future process of this matter before the Dubai Courts, because the process set down by the amendment to Article 28 is very clear that parties may not refer the dispute to Courts prior to reference to the Committee. This may, therefore, be read and applied by the Courts in Dubai to rule that commercial agency disputes should be first referred to the Committee before the Court. Although this has not yet been tested before the Dubai Court of Cassation (due to the very recent issue of Decree No. 3 of 2011) this approach is expected to be taken in the future litigation of registered commercial agency disputes before the Dubai Courts. Are there any disputes that may fall out of the committee’s jurisdiction and powers? The Federal Supreme Court defines disputes that fall within the jurisdiction of the committee as those arising by reason of the agency itself, such as its duration, territory, products and termination etc. The Courts shall have jurisdiction to hear disputes falling outside of the jurisdiction of the Committee, notwithstanding they appear prima facie to relate to issues of agency. Such matters include compensation for breach of contract between the agent and principal, as these disputes are considered as issues relating to the implementation of the agency agreement and not issues arising by reason of the commercial agency. Courts shall also have jurisdiction to hear disputes if the commercial agency is not registered as the jurisdiction of the Committee relates only to registered commercial agencies. Disputes in which claimants are seeking to prove the existence and validity of an agency agreement in order to procure registration fall outside the scope of the jurisdiction of the Committee and shall be heard by the Courts. Disputes relating to compensation for termination of unregistered agency agreement can be heard directly by Courts and not by the Committee, even if there are no written agreements. A final note to be added here is that although Decree 3 of 2011 establishing the Committee has 60 days to fix a date for hearing the dispute, it is not clear whether a party may proceed to the court if the Committee failed to so set a date. Under the old provision of the Law there was a practice that parties would usually proceed and file their complaint to the Court after the Committee exceeded the 60 days provided for under Article 28. This however is yet to be tested in light of the new amendment.